We are thrilled to announce the acquisition of Kitematic, the fastest and easiest way to use Docker on the Mac. Because Docker is a tool for developers, we find that the developers in the ecosystem build the best tools for Docker. Orchard’s Fig (now Compose) and SocketPlane are great examples of where great ideas were generated in the ecosystem to improving the developer experience and providing operational flexibility for distributed applications. Today with Kitematic, we take another step in simplifying the developer experience and making Docker accessible to new and different software developers – further growing and enriching the community and ecosystem together. 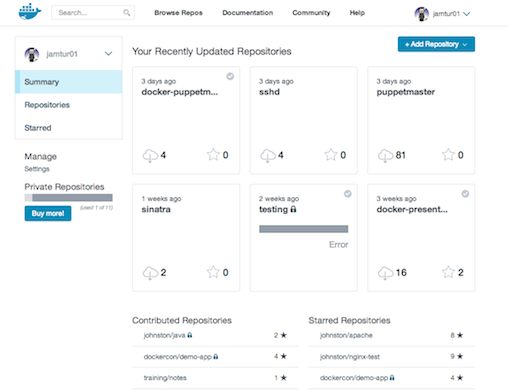 Kitematic completely automates the Docker installation and setup process and provides an intuitive graphical user interface (GUI) for running Docker containers on the Mac. Kitematic integrates with Docker Machine to provision a VM and install Docker Engine locally on your Mac. Once installed, the Kitematic GUI launches and from the home screen you will be presented with curated images that you can run instantly. You can search for any public images on Docker Hub from Kitematic just by typing in the search bar. Easily create, run and manage your containers from the GUI without having to use the command line or seamlessly switch back and forth between the Docker CLI and the GUI. Kitematic also automates advanced features such as managing ports and configuring volumes. Easily change environment variables, stream logs and single click terminal into your Docker container all from the GUI. Kitematic has grown to thousands of users in only a few shorts months since launching as a beta with positive feedback and thousands of Github stars. Together, we believe there’s a great journey ahead in shaping how developers interact with Docker and run their containers. Take a look at our roadmap on Github for more information and submit pull requests for anything you’d like to see. We’ll be expanding the team to tackle the features on the roadmap including a new Windows client so even more developers can quickly and easily run Docker on their machines. Of course, Kitematic will continue to be open-source and free for all via GitHub. The team would love to get your feedback and support, so why not start by downloading the latest build from kitematic.com. They “acquired” this software, meaning it was already developed by an indie OS X developer. Perhaps they will port what they can to Windows, but they only *just* aquired it. Be patient, or better yet – look up the code and start contributing. It’s open sourced. Please am having issues downloading a container via kinematic on my mac yosemite machine, it says “There was a problem connecting to Docker Engine in the VirtualBox VM. This could be caused because this Mac is currently connected to a vpn, blocking access to the VM” I do not have VPN installed, and i even turned off firewall to see if it would help, but still no solution… Please I need help on how to get passed this. Do you have something similar to this for Windows? Any advisable kitematic alternative for Ubuntu?